If you observe the events that took place recently, you’ll most likely notice that they have one thing in common: a social media campaign. Days, even months, before their event, organizers would make an account of their event on Facebook and/or Instagram, post the event details, creating a hashtag of their own, trying to garner a huge follower, even getting some buzzers or celebrities with huge follower numbers to mention them on social media to get followers‘ attention. And during the event, organizers would encourage attendees to share and post about their event on social media, then post and repost the experience of their attendees. The popularity of social media has pushed organizers to use social media to create a buzz for their event, before, during, and even after the event takes place. Getting likes, reposts, or regrams help the event reach a wider audience beyond their attendees and activate their brand. Do this before the event, and the campaign will help attract a bigger number of attendees to the event. Do this during and after the event, then the attendees and their follower will remember the event as a positive experience, so people will be more interested to attend the event if they’re being held again the next time. NFC wristband like PouchNATION is a way to help organizers socialize their event. It gives better brand mileage to the event and sponsors with its convenience and ease, and gives 7 times more impressions to their event and brand in the social media than “likes” and “check-ins“. Such a simple way to shift people’s attention to your event. 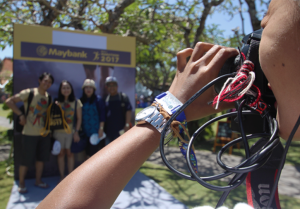 Plus, since NFC wristband is the new hip thing, event attendees will definitely get a new and fun experience when using their NFC wristband. No wonder more and more events are using NFC wristband, not only as a simple and easy payment method but also as a way to socialize their event on social media. It would be a shame to not leverage this new technology in your marketing campaign.